Burbo was a man unlike any other. For years every morning he swam back and forth across the grand river, only for the pleasure of it. And the waters contoured his face just a little differently, like it did with rock over a million years. A curve so minute that only a man with the eyes of a falcon, could ever tell the difference. Wildflowers grew in his hair from lying down too long under sun-splintered skies and every time he felt great love for the earth, they grew just a little more, until he carried on his head, a perpetual, interwreathed forest of wildflowers. The children came running unto Burbo just to get a whiff of the summer meadows, even in the coldest winter. Burbo had never noticed that he was a man unlike any other, for he thought that every man was a man unlike any other. Until one day, Burbo’s curious feet carried him to a town, where all men were alike. They paused, until all at once they burst aloud into great laughter. 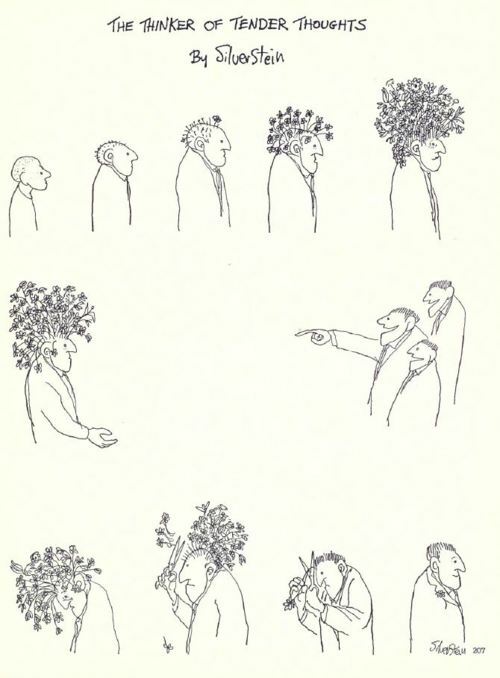 Burbo wondered for the very first time, why his head carried wildflowers instead of plain good old hair. Burbo cut his hair, the one with sun-splintered skies, rivers and wildflowers. He sold his wildflowers for all of twenty pounds and bought a new suit with it. Burbo donned a suit and all the men stopped laughing. Unfurling a child’s imagination, inspired by this wonderful illustration.